Description: Loretta was commissioned as part of "Bridging the Gaps: Guitars for Social Justice", a collaborative and interdisciplinary project that marries music and social justice advocacy. Description: This is the premiere performance of the Chamber Orchestra version of my Rosewood Concerto for Flute, Guitar, and Strings, With Sharon Sparrow on flute, myself on guitar, and the Oakland Chamber Orchestra, conducted by Alan MacNair. Description: Citizen Zero asked me to compose string orchestra parts for their great song, "Bangin' in the Nails". We then did a live recording session, and I had the privilege of conducting. What a great group! Description: This is the trailer for the SciFi feature, SCAR 23. Description: I composed this trio for Provost Jim Lentini, Bret Hoag, and myself. The title refers to the 15 strings of the lute I am playing, plus the two 6-string classical guitars. Description: These are short clips from the recording sessions for the film "The First Rosa". Description: This flute choir piece was originally composed for five antiphonal flute choirs and two soloists, to honor Sir James Galway receiving the Ford Distinguished Artist Award in 2009. I have reduced it to be playable by a five part flute choir with two soloists. Description: String session for Buchenwald section of "Journey to Justice", a film by Steve Palackdharry. Description: Recording session for "Air Force One: the Planes and the Presidents, Flight II" at Duns Scotus Chapel, Southfield Michigan. Description: Detroit Civic Symphony rehearsal for Orchestra Hall performance, November 7, 2008. Description: World premier of "Fantasie on Danny Boy", May 10, 2008, for the James Galway Distinguished Artist Award, at Hill Auditorium, Ann Arbor, Michigan. 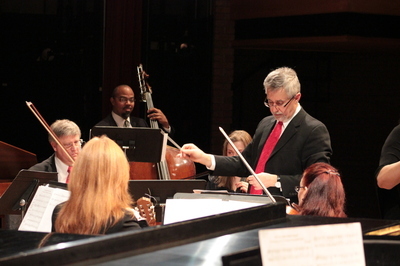 Description: Musica Mundi performing at Varner Recital Hall, Rochester Hills, Michigan, March, 2007. Description: Premiere performance of "Nevermore: a Macabre Tale" at Varner Recital Hall, Oakland University, Rochester Hills, Michigan. Description: Chamber Ensemble arrangement of "Wind Theme", performed by faculty of Oakland University, Rochester Hills, Michigan.